As most of my readers know, our much-loved grandson is 'train' crazy! We have travelled 'the world' on Moreton, the 110 year old train at The Ginger Factory; we have succumbed to the quirky little train at the Big Pineapple that ambles down to Wildlife HQ Zoo and have even enjoyed a fabulous day out on the Miniature Trains at Model Railway Park, in Nambour. More recently and very much to my delight, I discovered that the Mary Valley Rattler's steam and diesel engines were once again chugging along on a very historic journey, taking passengers on a nostalgic trip between the historic Gympie Station on Tozer Street and Amamoor. From the time I called to make a booking, to the time we disembarked from our three hour train trip down memory lane, our experience was truly unforgettable. On explaining to the booking personnel that my grandson experienced discomfort with crowds of people, they very quickly organised our very own carriage, the Guards Van. The disadvantage to this, I was told, is that we couldn't walk and explore between the different carriages, which for us was not really a problem, but rather a bonus. We were very happy to pay extra for this act of generosity, but were delighted to discover that there was no additional fee to be paid. The Mary Valley Rattler only recently embarked on her 'first run' on the 6 October 2018 and is offering trips on three days of the week - Wednesdays, Saturdays and Sundays. 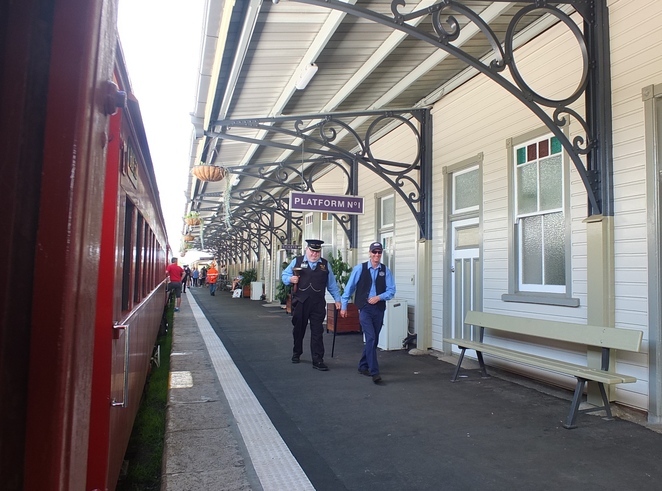 Having booked and paid for our tickets via phone call, all we needed to do upon arrival was to collect our tickets, giving us plenty of time to enjoy our surrounds and chat to the train driver and tour guides before boarding the Mary Valley Rattler. Piqueing my interest, of course, was the Gympie Station Gift Shop. 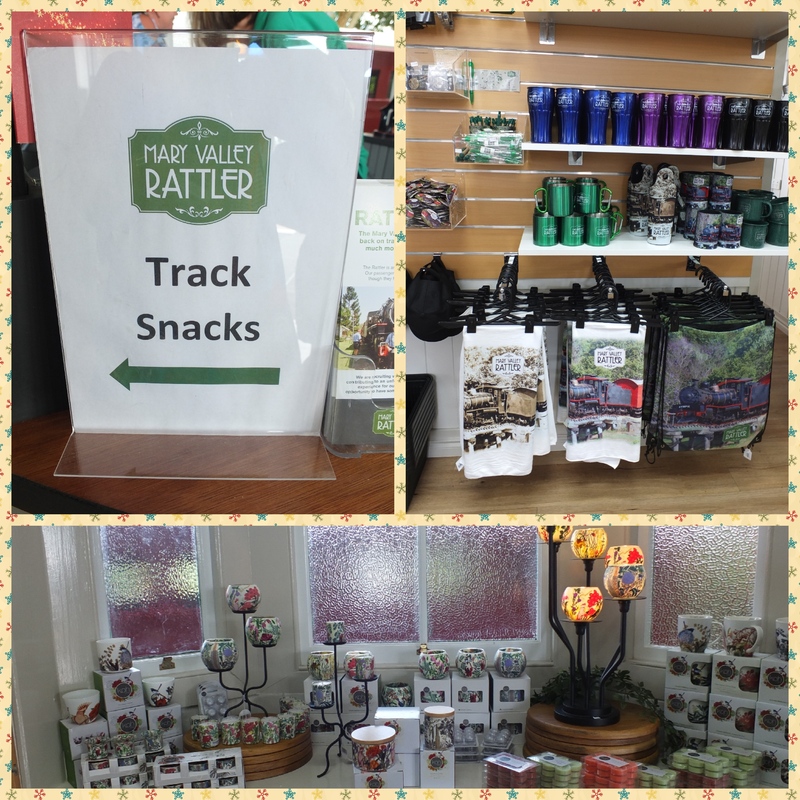 I cannot resist a fabulous Gift Shop any time of the year, and this of course, is also an opportunity for travellers to purchase Track Snacks for the journey, as no food or drink is served on board the Mary Valley Rattler, without prior arrangement. The revitalised Platform No. 1 Café is also located within the historical Gympie Station. This modernised ol' world eatery serves everything from coffees, to breakfast, to gourmet pizzas and even beers on tap, making it the perfect meeting place for a laid-back brekkie, brunch or lunch, all whilst enjoying the historical ambience. Our carriage, the Guard's Van was built in 1953 - older than me! - at the Ipswich Workshops. These 'cars' were designed for use on branch lines as a Guard's Van with passenger accommodation. The 'car' that we were fortunate to travel in ended its service in 1989 and because of its limited passenger accommodation is only added to the train on days of extra heavy bookings. 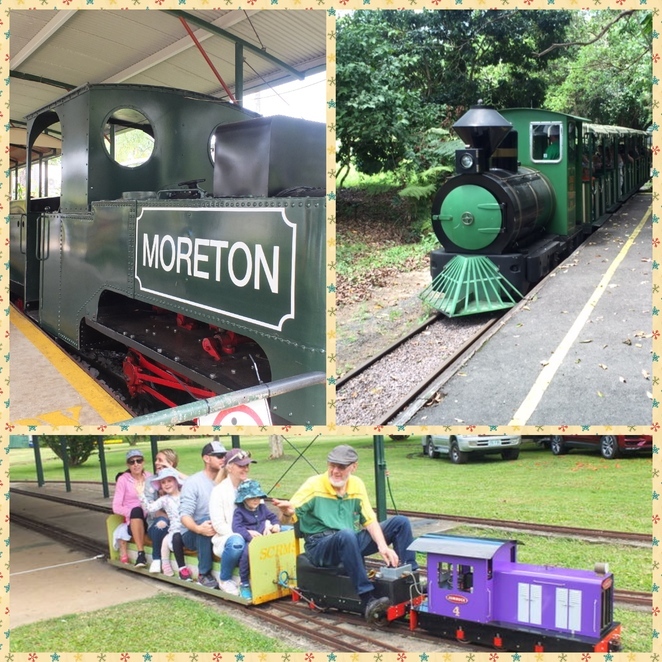 The Mary Valley Rattler steams its way past the local Monkland State School and onward through the Mary River, traversing around an abundance of railway curves, bridges and gentle hills. Enthusiastic residents in the scattered homes along this heritage track, all appear to be waiting with great expectation for the lovingly restored Mary Valley Rattler to show her elegant self, and emerge from behind closed doors to excitedly shower us with waves and friendly greetings. We felt like royalty. 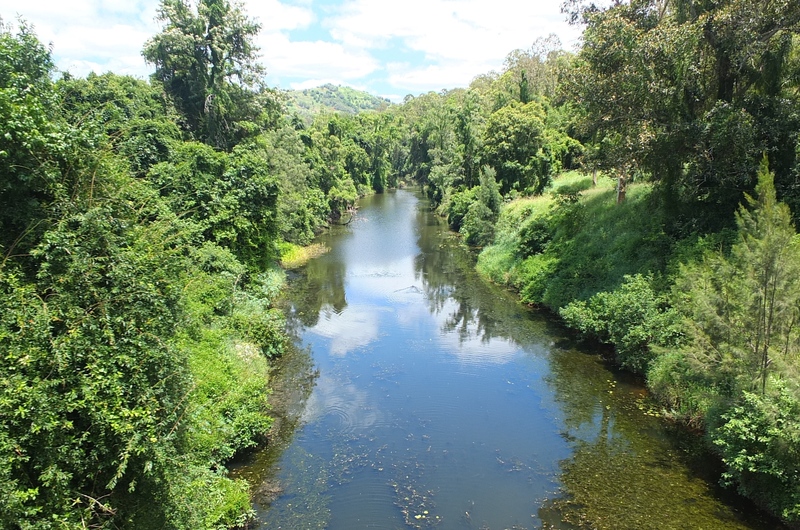 The track moves away from the river and into the valleys of some of the Mary River's tributaries, including the Yabba, Kandanga and the Amamoor Creeks before passing through Dagun, which is home to a beautiful heritage station. Local farmers were selling their specialities here, but we had to put this on hold until the return journey, when we would make a 'stop' at Dagun station. I believe from the Mary Valley Rattler's website that from 14 February this year, the train will no longer stop at Dagun Station, which will allow travellers more time in Amamoor. Our journey continued to the quaint community of Amamoor, nestled in the heart of the Mary Valley and bordered by a verdant forest reserve, which is home to more than one hundred and twenty bird species. We disembarked at Amamoor for the proverbial quick 'pit-stop' and more importantly, to watch on in awe at the amazing process required to turn the engine around on a turntable, for the return journey back to Gympie. Look out for the beautifully carved timber seats that manage to look like pieces of art all on their own. On our return journey to Gympie, the Mary Valley Rattler did indeed stop at Dagun Station. A worthwhile stop as Clyde's Shop was open, offering teetotallers tea, coffee and soft drinks. Not really falling into the teetotaller category, I was far more interested in the local wines, liqueurs and cheese tasting, on offer. 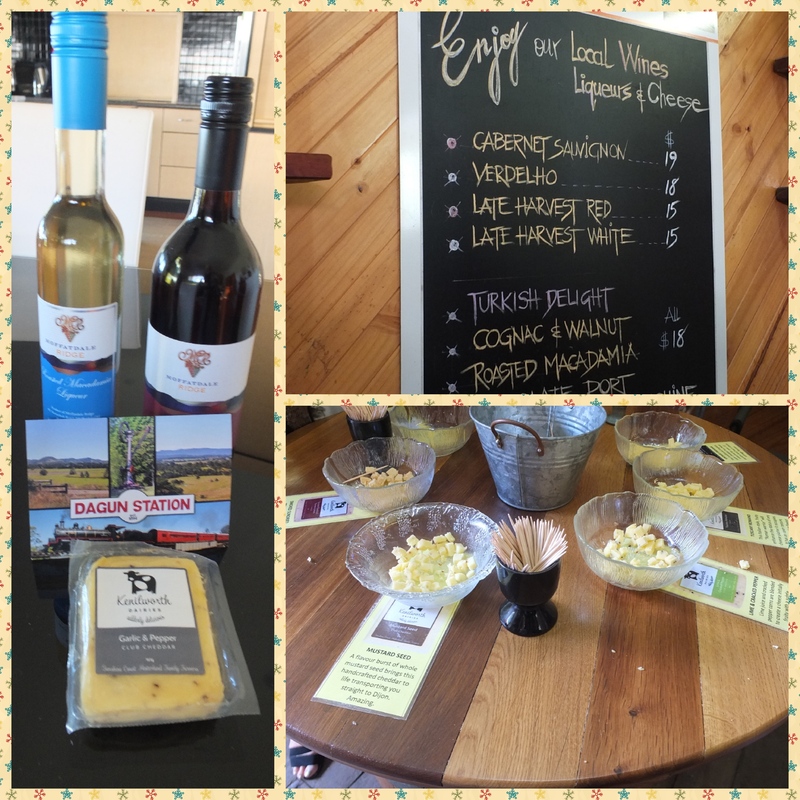 Travellers were spoilt for choice with delicious cheeses from Kenilworth and exotic-sounding liqueurs on offer from Moffatdale Ridge. Honestly, who would be able to turn the other cheek when faced with a bottle of Turkish Delight; Cognac & Walnut or the forbidden fruits of a Moffatdale Moonshine. So taste we did - and came away with a couple of souvenir bottles too. I love the idea of supporting local! At present the Mary Valley Rattler travels on three days of the week: Wednesdays, Saturdays and Sundays. Please click here for the timetable. Tickets are priced at $55 for adults and $30 for children, aged four to twelve years of age. Concession card holders, students, seniors and pensioners' tickets are priced at $45. A family of four - two adults and two children - are priced at $145. I have heard mention that families felt these prices were a bit on the steep side, but I can say, that without a doubt, this is possibly one of the most educational and fun ways for a family to enjoy time together, providing lasting memories that children will hold dear forever. Visitors' support through ticket and gift shop purchases aid the Mary Valley Rattler with the ongoing restoration and preservation of the historic Mary Valley Rattler experience.Tickets can be purchased online here, via the Mary Valley Rattler website. Retro Friday's is perfect for visitors who might be short on time. 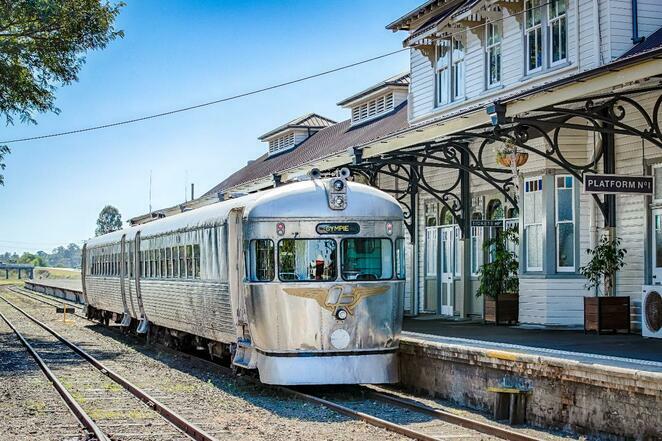 Every Friday throughout summer, train buffs can step back to the 1960's, aboard The Silver Bullet, to enjoy a return journey to historic Monkland Station. The Retro Friday trip is only thirty minutes and includes a breakfast or lunch at the Platform No. 1 Cafe. Tickets are priced at $30 for adults and $15 for children and can be purchased online here. For future events and tours on the Mary Valley Rattler, please follow the link here. The Mary Valley Rattler provides a once-in-a-lifetime experience and is also available for group events. 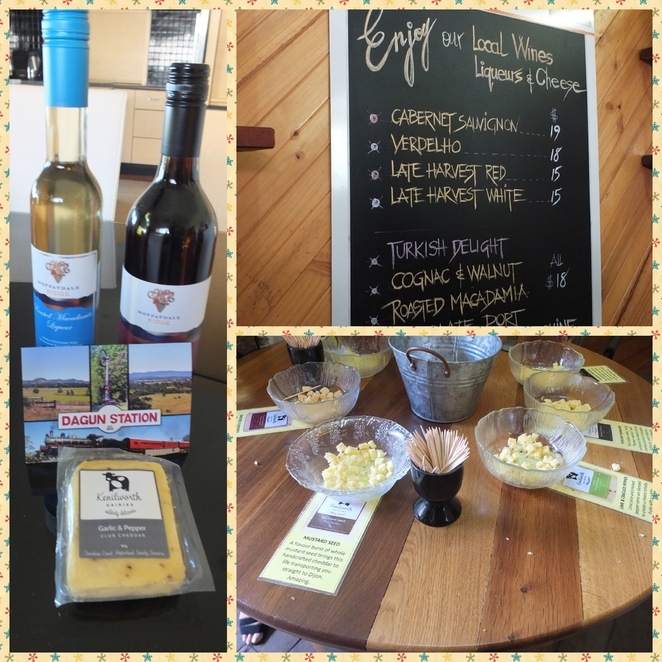 Full catering is offered on the carriages and is the ideal setting for cocktail-style events; cheese and wine parties or even corporate Christmas parties - the options are endless. Can you imagine having your wedding on board the Mary Valley Rattler? The dedicated staff members are happy to tailor menus to suit individual groups' requirements. For all function and group booking enquiries, please click here and complete the form. Alternatively, please call (07) 5482-2750. Another impressive fact: The Mary Valley Rattler is run by a team of dedicated volunteers and since our journey on board this wonderful train, I have come across advertising, via the Mary Valley Rattler Facebook, looking for volunteers to also become a part of history at the Gympie Station. If being a volunteer on this fabulous historic journey is something you would love to do, then please follow the Facebook or website link above. A nostalgic train trip on the Mary Valley Rattler made for a truly memorable day for my family and especially my grandson. 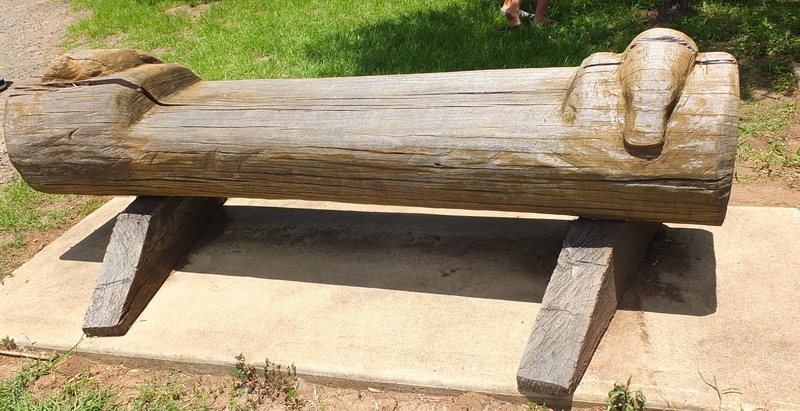 He was absolutely thrilled with our excursion into yesteryear and quite content to sit for three hours, whilst watching the world pass by. 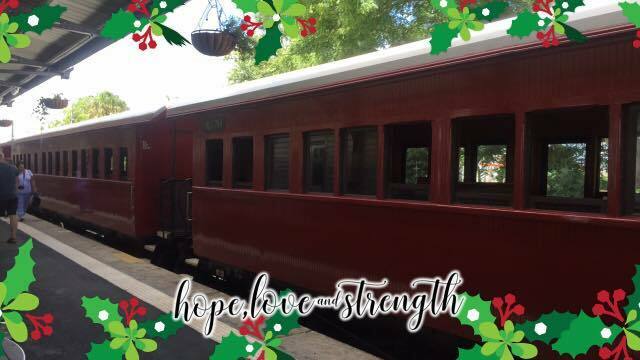 Hop aboard for a magical trip down memory lane on the Mary Valley Rattler! Hop aboard for a magical trip down memory lane! Congratulations for winning second place. Congrats on your prize in the comp. Such a great old train ride! Great article Elaine. Love the enthusiasm! I love trains! What a wonderful outing. Thanks for writing this one!